Lineal descendants of Wailuanuiahoano have returned to their ancestral lands, which are just mauka of the old Coco Palms Hotel that was destroyed by Hurricane Iniki. Under their care, the lands and waters are healing, and fragile native species are thriving. They have removed tons of hotel trash, cleaned the auwai (waterway), and protected ancient burials and native birds such as koloa, aeʻo, ʻalae and others. They have stood against the raging drug epidemic on Kauaʻi, and revitalized Wailua. This is part of a new era of peaceful, assertive, pono native reclamation and caretakership of ancestral lands, which has true potential for healing of lands, water and serious community issues, many of which originate with "legal" theft of lands to begin with. It has the potential to help overcome the despair that is at the root of the drug epidemic amongst young kanaka. It has the potential to begin the healing of the harm done by 125 years of brutal occupation of the rightful Hawaiian Kingdom, to begin the restoration process, and thereby to help to establish peace in the Pacific region and the world. Unfortunately, since their return, they have been harassed nearly constantly. They have been accused of trespass on their own ancestral lands, as well as physically intimidated and harassed. Death threats, extrajudicial police and courtroom abuses (including the detainment of an elderly mother of a Kiaʻi, wrenching her arm and then physically dropping her from a height of about 4 feet on a wooden bench in a courtroom, without disciplinary action to the bailiff or judge), community members bought out by CPH, false news and constant intimidation have plagued their efforts. This needs to stop. This harassment and persecution of the lineal descendants of the area originates from efforts to re-develop Coco Palms by Coco Palms Hui, LLC, which is led by Tyler Greene of GreeneWaters, Inc., and is backed by Hyatt Corporation, who have planned to bring 172 wealthy immigrant "investors" to Kauaʻi for about $500,000 each, in exchange for green cards. As this EB-5 process is known to bring in drug cartel (who can afford this), and certainly contribute heavily to kanaka displacement, there is serious concern. Greene has said his development "mantra" for the Coco Palms project is to "honor the past and celebrate the future". Which he apparently believes means as forcible removal of ancient peoples and real cultural practices, unprecedented traffic, destruction of native waterfowl habitat, and displacement of the local population, possibly with foreign drug-associated investors. Coco Palms Hui needs to understand: these are sacred ancestral lands, and the Protectors of these lands will never go away. Attempts to remove them by force would never be forgotten on a small island like Kauaʻi, and would only severely blemish the history of Coco Palms. Any tourist who cares about authentic culture whatsoever would BOYCOTT such an audacity. THE PEOPLE OF KAUAʻI AND THE CONSCIOUS PEOPLE OF AMERICA WILL MAKE SURE THAT THEY DO. Anyone claiming true cultural expertise would OPPOSE such wrongs against Kauaʻi's Original People for all time. 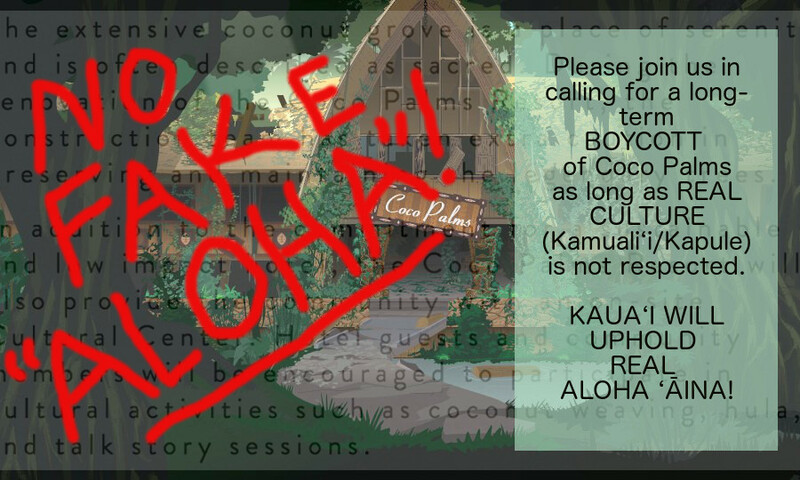 In light of the worldwide media fiasco created by Mark Zuckerberg's Quiet Title attempts, Coco Palms Hui needs to learn that the Kanaka o Hawaiʻi have had enough of being bullied. WE CALL ON COCO PALMS HUI, HYATT AND KNHCC TO PROTECT REAL CULTURE, AND THE PEOPLE OF THE LAND. DROP ALL CHARGES, STOP ALL HARASSMENT, REVERSE EJECTMENT ORDERS, AND TAKE A VISIBLE STAND FOR THE RIGHTS OF THE LINEAL PROTECTORS OF WAILUANUIAHOANO. "HONOR THE PAST AND CELEBRATE THE FUTURE" IN A REAL WAY! We call on the transitional governments of the State of Hawaiʻi and the County of Kauaʻi to act in accordance with Hawaii Revised Statutes, section 5-7.5, the "Aloha Spirit Law", and disallow any government interference with kanaka return to these and other ancestral lands. We urge the Governor of the State of Hawaiʻi and the Mayor of the County of Kauaʻi to acknowledge the ILLEGALITY of their own governments, as part of the forcible occupation of Ka Pae ʻAina o Hawaiʻi for 125 years, and to begin the process of healing and restoration that will result in our freedom and demilitarization. We call on the Special Rapporteur for Indigenous Issues and the Human Rights Committee of the Office of the High Commissioner of Human Rights at the United Nation to investigate this matter, to inform all relevant international bodies, and to advise us and the United States on the most peaceful means to end the US Occupation of our land and restore Independence to Hawaiʻi. We call on the PEOPLE of Hawaiʻi and the world to stand strongly against the wrongs that are being done. KAUAʻI AND THE WORLD WILL NEVER FORGET THE ABUSE OF KANAKA IN WAILUANUIAHOANO, and as such, THIS HOTEL WOULD BE A FAILURE. Coco Palms Hui knows this, but would still collect the investment monies as long as the hotel is built. The 172 EB-5 applicants need to know that they are being ripped off!! But they do not, so we need to make our voice LOUD AND CLEAR. COCO PALMS HUI, STOP THE ABUSE OF KANAKA NOW!!! All Hawaiʻi is standing together in the protection of Aloha ʻĀina, for the well-being of future generations, and we invite you to stand with us, not against us. Sherri Kane needs your help with “Coco Palms: Respect Kanaka!”. Join Sherri and 3,084 supporters today.